SONGKHLA: Provincial Police Region 9 has ruled out the possibility that two coordinated bomb attacks on Samila Beach in the southern province of Songkhla’s Muang district on Wednesday night (Dec 25) were politically motivated. Pol Lt Gen Ronnasil Phusara, head of Provincial Police Region 9, said the bombings had no political motive and investigators were looking at other possible motives, including a conflict among groups of local tourism operators. The explosions occurred about 10pm on Wednesday, one at the mermaid sculpture, and the other 300 metres away near the sculpture of a cat and rat, he said. Maj Gen Chatuphon Kalamphasut, deputy chief of the Internal Security Operations Command (Isoc) Region 4, said police were still unsure who was responsible for the attacks. Although some activities by insurgent groups in Yala, Narathiwat, Pattani and four border districts of Songkhla were previously detected in Songkhla, there was no evidence to suggest they perpetrated the bombings, he said. Songkhla Governor Wiranan Phengchan said security was being tightened to reassure tourists visiting Songkhla during the New Year long weekend. Deputy Prime Minister and Defence Minister Prawit Wongsuwon said earlier in the day that the attacks could be politically motivated but were not linked with the southern insurgency. However, he said the attackers may be based in the far South. “These attacks are an attempt to simply stir up unrest, given the fact that not a single person was injured,” he said. Gen Prawit said people should wait for the results of the investigation. Despite Gen Prawit’s comments, a security source said the two attacks might be the work of the Barisan Revolusi Nasional (BRN) bent on wreaking havoc among Songkhla businesses during the New Year festival. The BRN tends to choose a business district for its attacks, said the source. 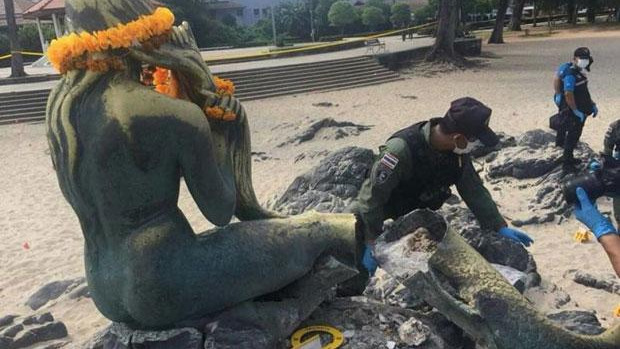 The iconic mermaid sculpture, damaged in one of the explosions, is popular among Thai, Malaysian and Singaporean tourists, said the source. The attacks could also be in retaliation against tough crackdowns on the trade of smuggled goods in the province's border areas, which is costing the insurgent group funding gleaned from the illegal trade, said the source. Thursday afternoon, two more explosions occurred in Khuan Niang District of Songkhla. Police were also looking into these two incidents. ... Well, if the police/army after more than 7 years terrorist activities, after more than 7000 killing innocent teachers, men/women and babies in the 'South' need advice, than there is something wrong with their approach/fighting these terrorist crimes. Right? Lucky no people were sitting with mermaid when it was blown into pieces. Given the positive comment from the serial commentator, have the Police taken steps to interview him about his intimate knowledge of these bomb blasts? What a nonsense. Of course it political and tourist disturbing motivated. How can the very slow working RTP and other 'crime autorities' mention about what it is not, before going deep into this affair. Always that talking before thinking/investigating thoroughly. They can resist a moment of press nonsense bla bla.